There are places in the world that can defy a travel writer’s art. There are scenes that are so breathtaking that they completely defeat him. 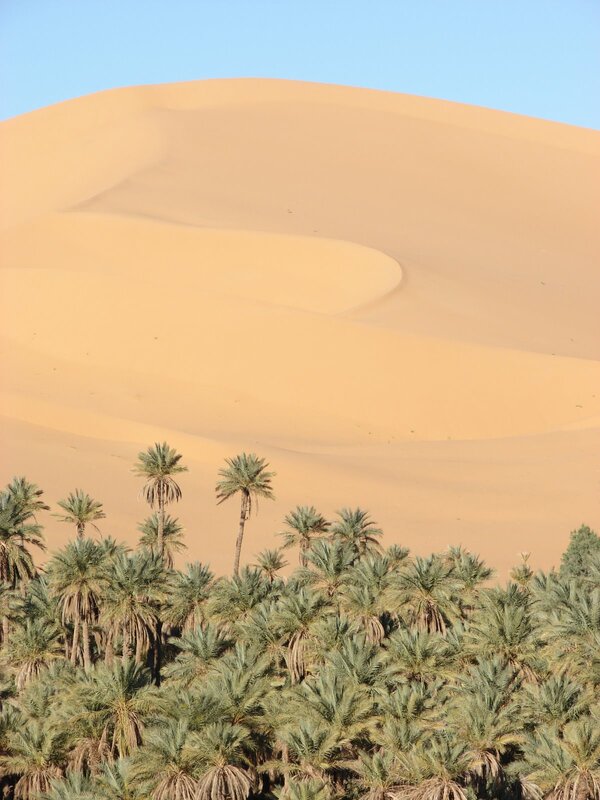 I feel that dunes of Taghit have defeated me.Taghit is an oasis village on the edge of the Grand Erg Occidental, Algeria’s western sea of sand. It is a small place with one main road, a big empty hotel, a post office, a Martyr’s Square (does every city in the Islamic world have a Martyr’s Square?) and a few cafés that are masculine temples to idleness. That is all. But the dunes that hover over the village make Taghit smaller still. As my bus crested the hill that overlooks Taghit to the north, the scene was remarkable. I grew up near the Rocky Mountains so I am familiar with massive landscapes, but this is different. Even when they are beautiful, mountains are hard and forbidding. They are rocky and, therefore, harsh. The dunes that tower over the Taghit oasis are the opposite of this. It seems impossible that things so huge, so overwhelming, can also seem so soft. The dunes change colour as the daylight changes. In the early morning they are a pale yellow and remind me of enormous lions laying on the landscape. They are most beautiful, though, at dusk when they turn deep orange, like the crema on the espressos I drink in those idle cafés. Dusk is also the time of day when the frogs sing in the palmerie. On the other side of the village is the valley where the palm trees grow. They form a strip of unlikely green where farmers grow dates and figs and fava beans. A fresh water spring feeds the gardens through channels dug in the dirt. Unfortunately, nothing is being harvested at this time of year. There are no dates in the palms, and the figs are still as small as grapes.